In June 1964, Life magazine published a feature article delving into the secret world of gays and lesbians entitled “Homosexuality in America” (Google archive). The opening spread featured a photo of a mural in a San Francisco gay-leather bar. In Bahman of 1345 (1967), the article was translated and published in the weekly Omid-e Iran, including the opening photo spread. Omid-e Iran was a popular magazine published by Ali Akbar Safipour, then a member of Parliament. The translator of the article was one Mr. Abdol Rahim Govahi of Shiraz, who is reported to have been a petrochemical engineer with degree from Abadan, an MBA from Harvard, and was working as a system engineer at IBM in Tehran. The translated article and picture were delivered to the Omid-e Iran offices by Mr. Govahi’s brother. Days after the publication of the article, the publisher Mr. Safipour finds himself being interrogated by SAVAK. The allegation is that the picture in question has an x mark next to a figure that has a striking resemblance to His Majesty, the Shah. Safipour claims although he had reviewed the article beforehand, he had not seen the picture, which is normally left to the judgment of the editor, who has now been sacked for negligence. He goes on to claim that putting an x at the end of the article is the customary way for the writer to denote the end of the article, and it this case the x being transferred to the figure resembling the Shah at time of printing is purely coincidental. 1. Conduct detailed routine investigation of the fired editor. 2. Conduct necessary investigation of the translator, Abdol Rahim Govahi. 3. Investigate the brother of Abdol Rahim Govahi, who delivered the article and picture to the magazine. 4. 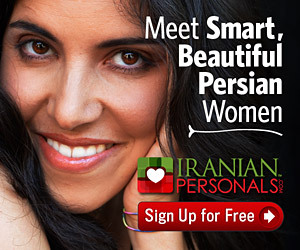 Investigate those who had a part in distributing Life magazine in the country (Iran). 5. Initiate legal proceedings for closure of Omid-e Iran. 6. Conduct further investigation of Mr. Safipour. 7. Initiate proceedings to follow (track) all those involved. The whole episode is farcical and sad, of course. An x that ended a career (of the editor, a Mr. Ali Asghar Afrasiabi) and set the wheels of the nation’s security apparatus into motion — which, in an autocratic society, are always in motion anyway. My suspicion is without the x, no one would have noticed the picture and its close affinity with the leader of the country. I was curious. The picture does indeed have a striking resemblance to his majesty. A little googling revealed the following detail. The picture is of a mural in the Tool Box, a popular gay/leather bar in the south-of-Market district of San Francisco in the sixties. The bar was demolished in the seventies, but the lone mural stood for a couple of years longer (see photo). The painter of the mural was Chuck Arnett, who arrived in San Francisco in 1962 and was at the time bartending at the club. He has published cover art for magazines and is known for his use of iconographic figures typically modeled after James Dean and Marlon Brando. (The figure in question resembles neither of those two.) Arnett died in 1988.
Who was the inspiration for the “shah” figure? We’ll probably never know. The Shah was in the news of the day, having travelled to the US in 1949, ’54 (including visits to San Francisco, New York and Miami Beach), ’58 (including visit to San Francisco and a hair cut), ’62 and June of ’64. 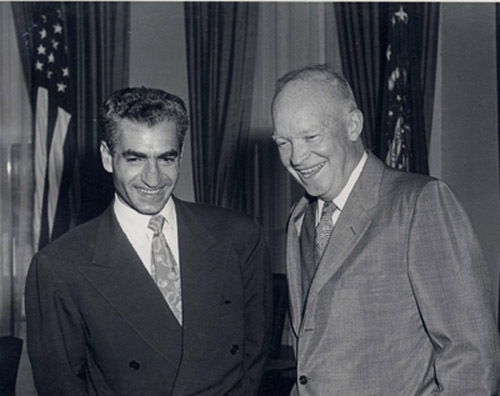 So it is possible that Arnett may have seen a picture of the Shah, like this one with Eisenhower in 1954. Then again, it could be the figure of some random patron. But the resemblance is tantalizingly striking even now, 46 years after an innocuous x set off a firestorm. 1. the SAVAK documents refer to “Life magazine, year 1964, number 26”. It is actually the June 26 issue of that year. 2. Wonder if anyone has a copy of the Bahman 1345 issue of Omid-e Iran. What would Prince of Persia do?